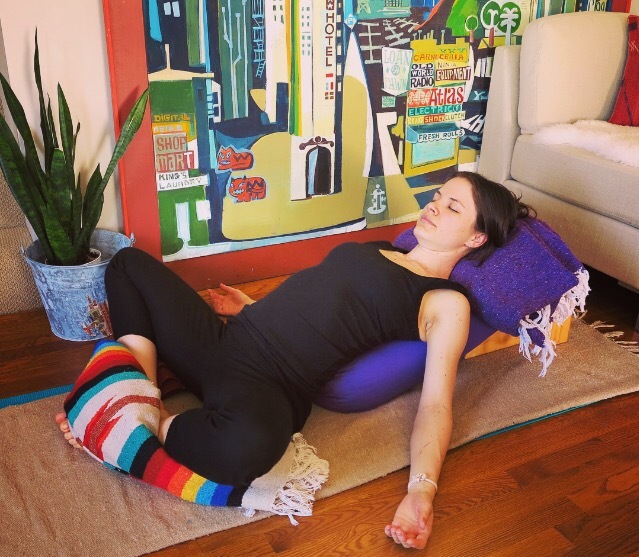 Ring in a Summer of L❤️VE with Queen’s pose: a heart-opening restorative asana that floods the body with the healing powers of love and a hand-blended bottle of Bach flower essences meant to nourish your ability to love and be loved! I remember the first time I experienced this pose in a prenatal yoga class. It was a ground breaking moment in my pregnancy. I felt connected to and at peace with this new being I was growing inside me despite the changes going on in my body. I felt a release in my heart and the opening I needed in my body and mind to make room for this new life. I was preparing to welcome this baby in the most gentle and natural way possible. I revisit this pose often to slow down, breathe and recharge. To calm the central nervous system with this highly beneficial pose. To feel the support beneath me and listen to my breath as I go inward and rejuvenate on a cellular level. The corresponding Flower Formula to this restorative pose is called Summer of L-❤️-V-E, a hand-blended bottle (by me!) of carefully chosen Bach flower essences intended to nourish your ability to love and be loved. To be a vessel that receives love, radiates love and embodies love! The best part is… it’s powered by nature. I began studying homeopathy & the Bach flower essences after my baby was born. I’ve been taking flower essences for most of my life. I’ve learned so much and feel it is important to share this gentle yet profound healing system with others. So I’m working on setting up my shop so I can do just that! Leave a comment below or contact me directly to pre-order your own Summer of L❤️VE Flower Formula.